Memories by AmyInKy: I'm Guest Designer!!! Recently I participated in a Survivor-style scrapbooking contest at Personal Scrapper. I made it into the top four and part of my "parting gift" was the opportunity to be Guest Designer one month. 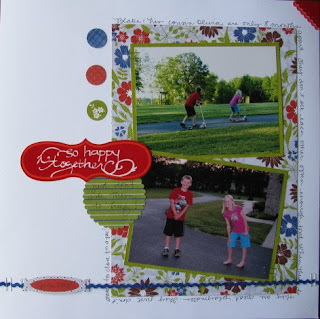 My month was July and I had SO MUCH fun working with their kit using the "Glad Rags" paper line by Paper Salon. 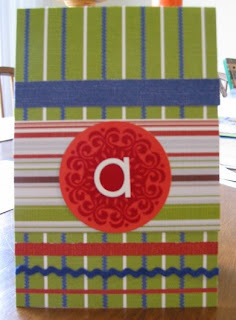 My kits always include double cardstock, so I was able to complete 10 layouts (one a 2-pager) and a card. 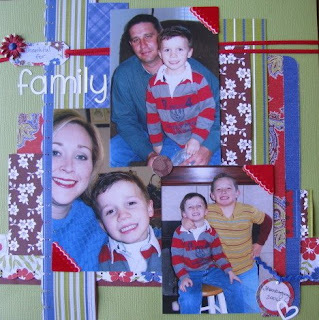 "Thankful for family" was the last layout I finished. 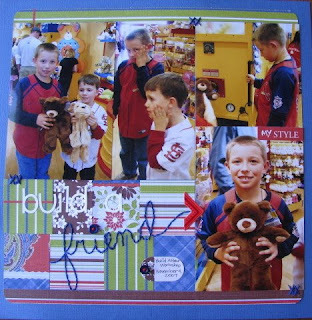 I used up many of my scraps from the kit for this one using pics from Thanksgiving '06. The photos never went with traditional fall/Thanksgiving papers. I love them with these Paper Salon papers. 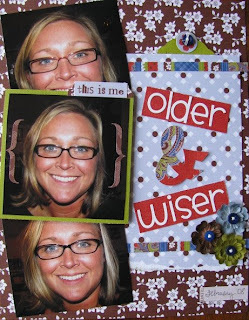 "Older & Wiser" has some hidden journaling on a tag that talks about my recent need for reading glasses. I enjoyed hand-stitching part of my title for "build a friend". That was a new technique for me! I think I will try it more often. I love the look. 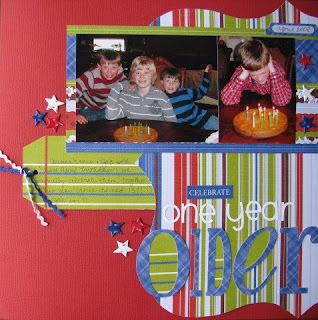 For "Celebrate One Year Older" I used a Making Memories die cut paper as a template on my striped paper. I'll share the other layouts soon. You did great Amy! You are so good at whipping out the layouts! can't wait to get my july kit (still haven't got it) and tear into it- i love what you have made with yours. makes me envious.